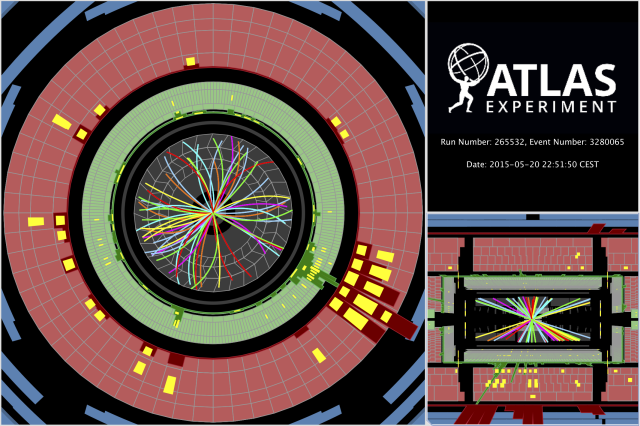 Display of a proton-proton collision event recorded by ATLAS on 20 May 2015, at 13 TeV collision energy. Tracks are reconstructed from hits in the outer parts of the inner tracking detector which were switched on at the time. The green and red bars indicate energy deposits in the Liquid Argon and Scintillating Tile calorimeters respectively. "These first 13 TeV test collisions are very important for us as it allows a full dress rehearsal of the experiment's performance, as well as the symbolic closure of the upgrade of the experiment," says Alex Cerri. Cerri and Alessandro Polini are ATLAS' run coordinators and have spent many months leading experiment commissioning and preparing for full detector operation. "It has been tough and crazy at times, but working with highly-motivated groups of experts with constructive attitudes, all of them accommodating different needs and pushing the tools and ourselves to perform at our best and deliver on time has been extremely rewarding and motivating," says Polini. In the LHC's Run 1 (2010 to 2012) and during the last two years of the Long Shutdown, ATLAS has faced and resolved issues foreseen and unforeseen -- from delays in deliveries and non-conformities of parts to consequences of unscheduled power cuts. "From Run 1, we have learned essential lessons for data-taking and from the Long Shutdown, for future upgrades. Probably the most important one is to be prepared for the unexpected and to have -- when possible -- a backup solution if crucial systems are temporarily unavailable," says Cerri. Once ATLAS and the other experiments have performed calibration tasks with the pilot beam collisions, ATLAS will begin recording data for physics analyses and pushing the boundaries of human knowledge.